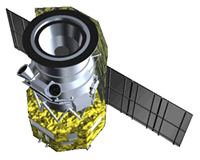 The infrared astronomy satellite AKARI started the regular observations in May 2006. In the last one year, AKARI has carried out the All-Sky Survey observations to map the entire sky, as well as thousands of pointed observations of selected targets. 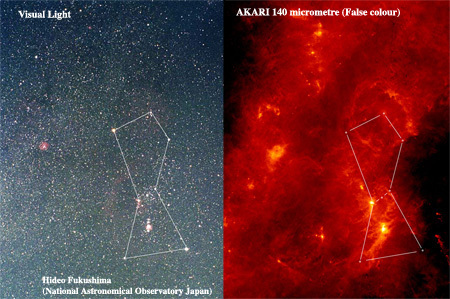 Here we show the beautiful images constructed from the AKARI All-Sky Survey data; The entire sky in the mid-infrared light, the far-infrared image of the constellation Orion and the Milky Way, and the far-infrared image of the Cygnus-X region. Objective: All-Sky Survey in infrared light. Investigating the birth and evolution of galaxies, stars and planets. The AKARI Project is carried out with the participation of mainly the following institutes; Nagoya University, The University of Tokyo, National Astronomical Observatory Japan, European Space Agency (ESA), Imperial College London, University of Sussex, The Open University (UK), University of Groningen / SRON (The Netherlands), Seoul National University (Korea). The far-infrared detectors were developed under collaboration with The National Institute of Information and Communications Technology. One year after the beginning of scientific operations in May 2006, AKARI continues observing. 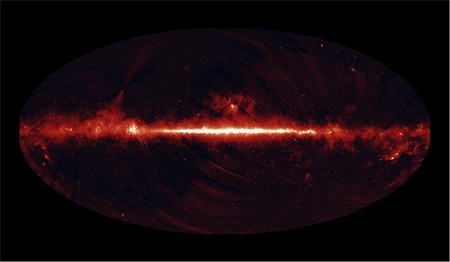 All-Sky Survey observations in six wavelength bands. More than 90 % of the entire sky has been observed twice. Observations are continuing in order to cover the regions not yet observed twice. The first census of the infrared sky since the atlas made by IRAS 24 years ago with improved spatial resolution. Observations at cryogenic temperatures with liquid Helium (with all instruments) are expected to continue until at least early September 2007. We are considering to continue observations beyond the liquid Helium boil off with the near-infrared instrument (covering 2--5 micrometres) using the mechanical coolers. This image is created from the data taken by one of the onboard instruments, the Near- and Mid-Infrared Camera (IRC). The centre of our Milky Way Galaxy is located at the centre of the image. The bright region extending from left to right is the Milky Way. The interstellar dust is heated by the stellar light and radiates infrared light. The data used to create this image have a spatial resolution of about 9 arcseconds, several times finer than the previous IRAS survey. AKARI also carries out the All-Sky Survey in the additional 18, 65, 90, 140, and 160 micrometre wavebands. Figure 2. 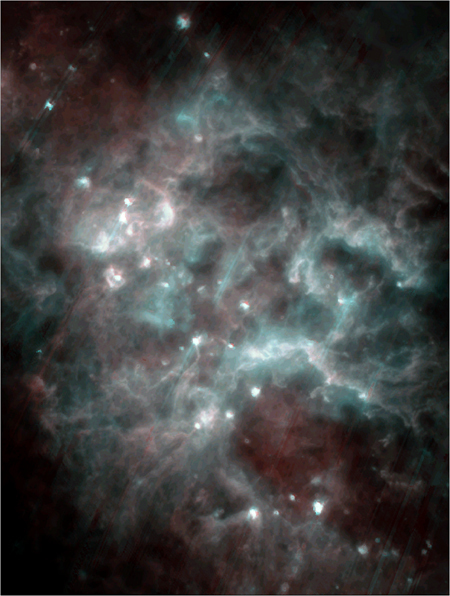 Constellations and dark clouds actively forming stars are indicated on the same 9 micrometre all-sky image. Images in the visual light (left) and the infrared light (right) are compared. This image covers a sky area of 40 degrees in the vertical direction. Dust grains in high-density molecular clouds are heated up by the newly born stars and emit strong infrared radiation. This is the first image of the Orion region at infrared wavelengths longer than 100 micrometres at such fine resolution. Our Galaxy is disk shaped and exhibits a spiral structure of stars. However, the stars that we see in the visible images of our Galaxy represent only a fraction of the total material of our Milky Way. In addition there are copious amounts of cold gas and dust existing at temperatures below -200 C. The distribution of this cold gas and dust is not uniform. High density regions gravitationally attracts more and more matter from the surrounding regions, until eventually stars are formed. The emission of the cold dust and gas is invisible to us when observed in normal light, however, this material instead emits at longer wavelength infrared light. Thus, observations of the sky in infrared light can tell us where and how are this invisible gas and dust is distributed across the Galaxy. In the regions where stars are actively being formed, the dust is warmed up by the stellar light and also emits in infrared light. Therefore, by tracing this infrared emission we can search for and study the site of current active star formation in our Galaxy. 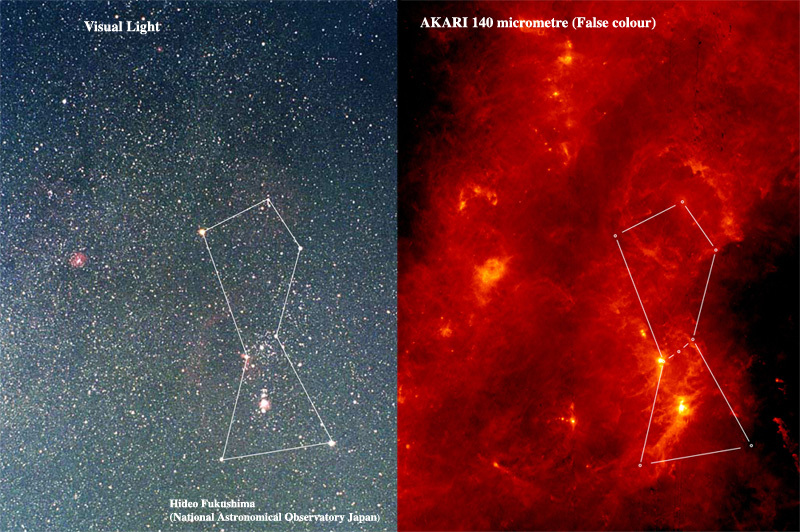 The AKARI mission is currently observing the entire sky in infrared light. This image is the All-Sky Map in the 9 micrometre wavelength range. The bright stripe seen running across the centre of the image from left to right is the disk of our own Galaxy (known as the Galactic Plane) looking from the Earth into the disk. The brightest region in the very centre of the image is towards the direction of the centre of our Galaxy. In this direction old, bright red stars crowd together adding their contribution to the infrared emission of our Galaxy in addition to that from the interstellar dust. We see several bright regions corresponding to strong infrared radiation along or next to the Galactic Plane. These regions are sites of newly born stars where we are viewing the radiation emitted from the heated dust. Note that Zodiacal emission component is crudely removed from this image. Nearby Galaxies and active Galactic star-forming regions appearing bright in the infrared are indicated on an identical image to Figure 1. The image tells us where in the Galaxy, stars are actively being formed. Further detailed analysis of the data used to make this image will be used to study the physical conditions of these star formation regions. In particular, we point your attention to the object in lower-right area in the image, indicated as the "Large Magellanic Cloud". This object is in fact a galaxy that neighbours our very own Milky Way. The fact that the Large Magellanic Cloud also appears bright in the infrared implies that active star formation is also ongoing in this galaxy as well. Although they are not seen at the current resolution of this image, there are many such galaxies in the Universe undergoing active star formation. AKARI will also observe these galaxies to build up a comprehensive picture of the star formation history of the Universe. This image covers a region of about 30x40 square degrees and includes the constellation Orion. Such a large regional image to high resolution at wavelengths beyond 100 micron is only realistically possible with an All-Sky Survey mission like AKARI. Such a survey may not be carried out again for many many years to come. The right half of the image covers the constellation Orion, while the left side is the Monoceros. 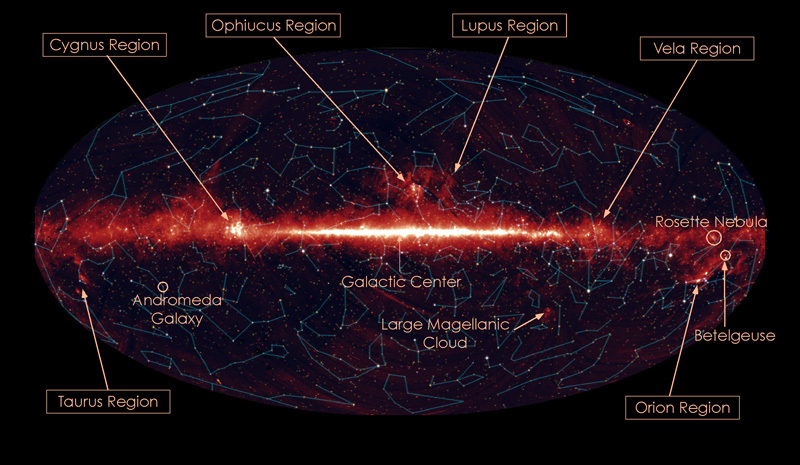 The Galactic Plane is located from the top to bottom in the left side of the image. Cold dust in the Galactic Plane appears as diffuse radiation over the entire image. The very bright source just below the belt of Orion is the famous Orion Nebula (M42). Many stars are being born in this nebula, and the dust heated up by these stars emits very strongly in infrared light. The bright object on the left side of Orion's belt is another major star forming region which includes the Horse Head nebula. In contrast to its appearance as a dark cloud in visible light, it is extremely bright in the infrared. The bright extended emission seen in the middle-left part of the image is the so called Rosette Nebula, yet another star forming region. Finally, the big circular structure centreed at the head of Orion is clearly visible. Presumably many heavy stars were formed at the centre of the circle, Causing a corresponding series of supernova explosions that has swept out the dust and gas in the region forming a shell-like structure. The Orion Nebula is located about 1500 light years away from the Earth and the Rosetta nebula is at a distance of 3600 light years. An infrared image of the "Cygunus-X" region taken by AKARI. The image covers 7.6 x 10.0 square degree region in the constellation Cyguns. This region is in a direction along the so called "Orion arm", one of the spiral arms in our Galaxy. Many objects at distances of 3000--10000 light years are projected on this small region. We see the Galactic plane from the top-left to bottom-right.